, a Spanish ex-jesuit, was born at Balbastro, in the kingdom of Arragon, in 1732, and at the age of ten, went to Salamanca, where he began his studies with great ardour, and made extraordinary proficiency in mathematics and physics. 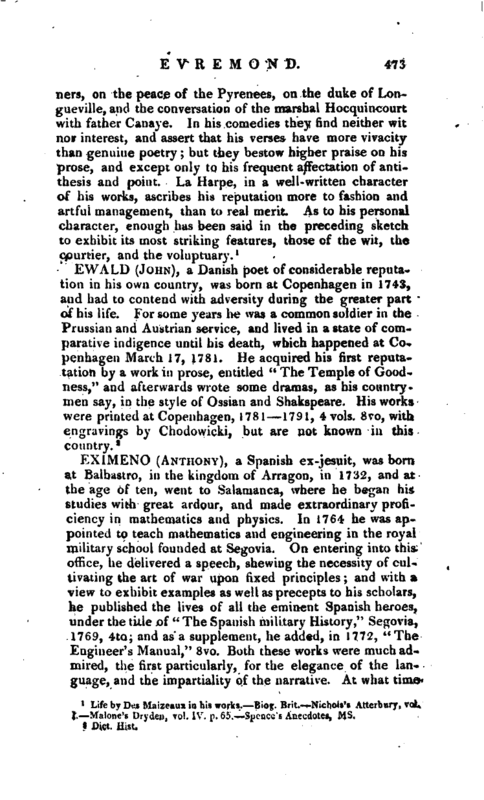 In 1764- he was appointed to teach mathematics and engineering in the royal military school founded at Segovia. On entering into this office, he delivered a speech, shewing the necessity of cultivating the art of war upon fixed principles; and with a view to exhibit examples as well as precepts to his scholars, he published the lives of all the eminent Spanish heroes, under the title of “The Spanish military History,” Segovia, 1769, 4to; and as a supplement, he added, in 1772, “The Engineer’s Manual,” 8vo. Both these works were much admired, the first particularly, for the elegance of the language, and the impartiality of the narrative. At what time | he entered the order of the Jesuits is not known, but after their expulsion, he lived at Rome, and devoted his attention chiefly to music, of which, from his infancy, he was passionately fond. After six years’ labour and study, he produced a work on the subject, which contributed, although without much reason, to his reputation in the musical world. This appeared at Rome in 1774, and was entitled “Dell‘ Origine e della regole della Musica, &c.” 4to, in which, says Dr. Burney, too confident of his own powers, he imagined himself capable, with four years’ study only, intuitively to frame a better system of counterpoint than that upon which so many great musicians had been formed. 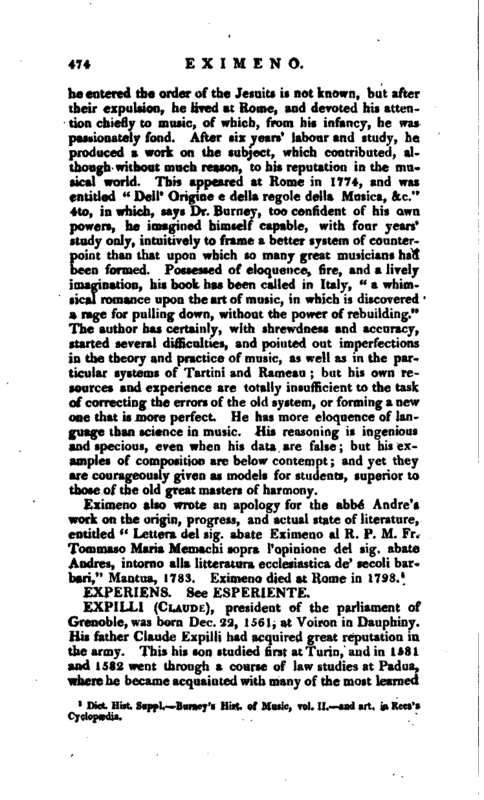 Possessed of eloquence, fire, and a lively imagination, his book has been called in Italy, “a whimsical romance upon the art of music, in which is discovered a rage for pulling down, without the power of rebuilding.” The author has certainly, with shrewdness and accuracy, started several difficulties, and pointed out imperfections in the theory and practice of music, as well as in the particular systems of Tartini and Rameau; but his own resources and experience are totally insufficient to the task of correcting the errors of the old system, or forming a new one that is more perfect. He has more eloquence of language than science in music. His reasoning is ingenious and specious, even when his data are false; but his examples of composition are below contempt; and yet they are courageously given as models for students, superior to those of the old great masters of harmony. Dict. nit. SuppK-^Burney’s Hist, of Music, To). II, and art. in Rees’s Cyclopedia.